Each spring the Town goes through the exercise of budgeting for the coming fiscal year, which begins on July 1st. Here’s the super summarized version of how it works. The Town Manager proposes a budget, there are public comment sessions, and finally the Town Council makes changes before adopting a final version. The mill rate is set, and from there the tax bills are generated. It is the property owners, ultimately, that fund the Town’s operations. The Town’s budget is based on goals and priorities. The Introduction to the Town Manager’s proposed budget summarizes the mission in the form of “Organizational Values” and “Public Policies for the Future.” Here are quick summaries of the six Public Policies that serve as guiding goals. Keep in mind that these brief sentences are distilled from short paragraphs in the actual document. 1. Be among the safest towns in the region. 2. Be a leader in education. 3. Maintain the best physical appearance in the area. 4. Provide the best customer service. 5. Incorporate market forces and entrepreneurialism. 6. Include all residents when setting policy. These goals help Town leaders allocate resources between competing priorities. It’s easy to get distracted by the headlines, or lost in the details of budget spreadsheets, but the numbers are supposed to support big picture goals. In the Town of West Hartford, these are the current goals. With the discussion framed, let’s get into the numbers, starting with the headlines that you may have seen in previous coverage of the budget. The Town Council voted to adopt a budget on Thursday, April 24th. The budget is 3.7% higher than the current year budget, which translates into about $8.9 million in additional spending. General Fund spending will be $250.8 million, and the mill rate will be raised by 2.9% to 37.37. None of the goals listed above are money makers. Instead, the objective of municipal government is to coordinate critical services for the community and distribute the costs. The first four can be loosely tied to specific Town departments. Safety is provided by police/fire; education is the domain of the schools; a pleasant appearance is designed by planning & zoning and maintained by public works; customer service is part of all the departments and is ultimately everyone’s responsibility. The essence of the fifth goal is that the Town will manage its activities responsibly, meaning they will try to use their resources efficiently. There are many different ways to look at the budget. The headline numbers discussed above, which are cited in most articles, reflect spending from the General Fund. They incorporate most of the Town’s expenses, but not everything. Let’s stick with those numbers for now, and look back historically at how they have changed over time. The chart below shows General Fund expenses from the fiscal year ending in 2010 to the recently adopted budget for the year that will end in 2015. The education portion of the West Hartford budget makes up about 58% of General Fund spending, which is by far the largest category. 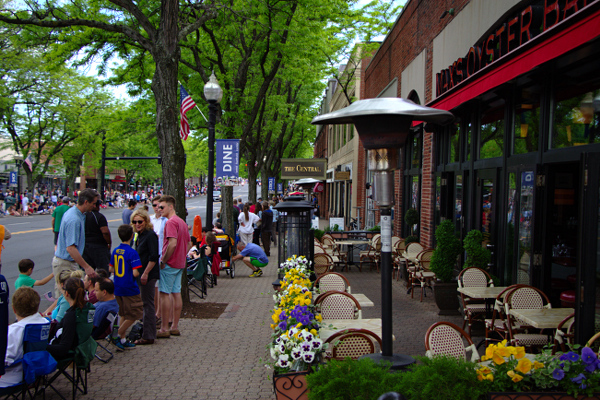 Other services provided by the town represent a little over 36% of spending. Police, Public Works and Fire tend to be the top three expenses in the Town category, with about a dozen more line items making up the balance. Debt service rounds out the General Fund at approximately 5% of Town spending. Expenses have been rising since 2010. The budget has grown by about 18% in that time. Education expense increases have matched those of the overall budget. Town expenses have grown a little more quickly, about 24%, while debt costs have actually decreased. The other side of the budget equation is revenue. Specifics for the budget adopted for 2015 are not yet available, but the distribution of revenue will likely be very similar to the current budget year. For 2014 over 85% of the Town’s income was from the property tax. Another 9% came from a different level of government (state or federal aid), and the final 5% was from all other sources. Municipal government exists to serve the community, and the Town’s 6th goal speaks directly to including residents in the conversation about how the Town is run. There was very little interest in this year’s budget process. Kyle was one of eight individuals who attended the April 8th public comment session. Media reports about the April 10th session made it sound like attendance was comparable. Transcripts of the session (on the Town’s website, as are video recordings) show that four of the residents who spoke at the April 8th session also spoke on April 10th. Whether one supports the budget or not, it’s important to understand how the process works and to check in on the trends every now and then. 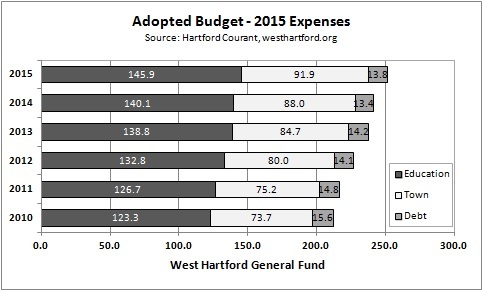 Based on this budget cycle, all is well in West Hartford.